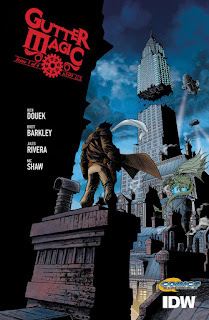 The Fellowship was fortunate enough to obtain a copy of GUTTER MAGIC #1 from IDW Publishing. Rich Douek writes, Brett Barkley draws, Jules Rivera colors, and Nic J. Shaw letters. Cinder comes from a family full of wizards, but he can’t even manage the most minor spell. So he’s off to find all of the parts of a powerful spell that can give him access to the magic his family expects of him. Along the way, though, he’s racked up debts and annoyed a lot of the wrong kinds of people, and now he’s almost friendless and running for his life. Despite the high-fantasy feel, this is a world based mostly on our own. The idea is that wizards got involved in World War II, and then things got interesting. We’re entering the story as Cinder’s quest is just about completed, but there’s still plenty going on. There’s also a lot to learn about this “new” world, and those kinds of stories are among my favorites. The art has a cool steampunk feel to it, and does a bunch of perspective play that is really well done. This is one seriously complicated quest story in a richly fantastical world. There’s a lot to get hooked on in this first issue, so get on board now. 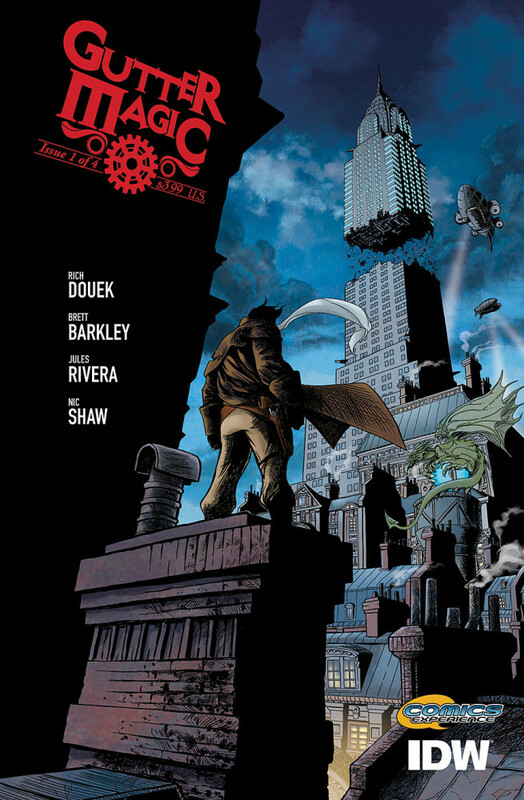 GUTTER MAGIC #1 is available now at your FLCS or at idwpublishing.com.